(front) Iris Millan and Esther Mendez. (Back) Veronica Ramirez, Carlos Diaz and Ross Clymer all pose in Millan’s campaign office. “I’m an immigrant, I’m a mom and a student,” ENLACE graduate student Iris Millan would say as she canvassed to the people of Humboldt Park, Wicker Park, Logan Square and the rest of the fourth district in Illinois. She was hoping to entice them to vote in the Illinois Primary election on March 20. Millan ran for Illinois House of Representative of the 4th District and although Delia Ramirez won, Millan shared how the support from her community and government services helped her even run for office. Millan came to the United States when she was 8, not knowing a word of English, and was reunited with her parents after being separated for seven years. She also met her five-year-old sister for the first time. Millan said she was assigned, along with several other students who were also English learners, an English tutor. Millan graduated from NEIU with a political science degree in 2008 and started the ENLACE program in 2016, unaware she was going to run for office this year. Millan gravitated towards public service because of her personal experiences being an immigrant, a mom and a student of public colleges. By being eligible for SNAP benefits, a medical card, as well as receiving the MAP and Pell grants, Millan was able to take care of her daughter. These benefits allowed Millan, who had her daughter during her sophomore year in college, the ability to continue her academic career. Millan was originally unaware she was a U.S. citizen until she applied for citizenship when she was 21. Her parents were naturalized when she was 17, and neither her parents or Millan were aware that she automatically was naturalized because she was still a minor. The officer looked up the denial code and told her it meant citizens cannot apply for citizenship. “It was a relieving moment for sure, but I was upset beyond belief,” Millan said. “I could have been voting for the past three years. I felt disenfranchised and it put a lot of things into perspective of how many other people are still disenfranchised in our communities because of such a broken communication system. 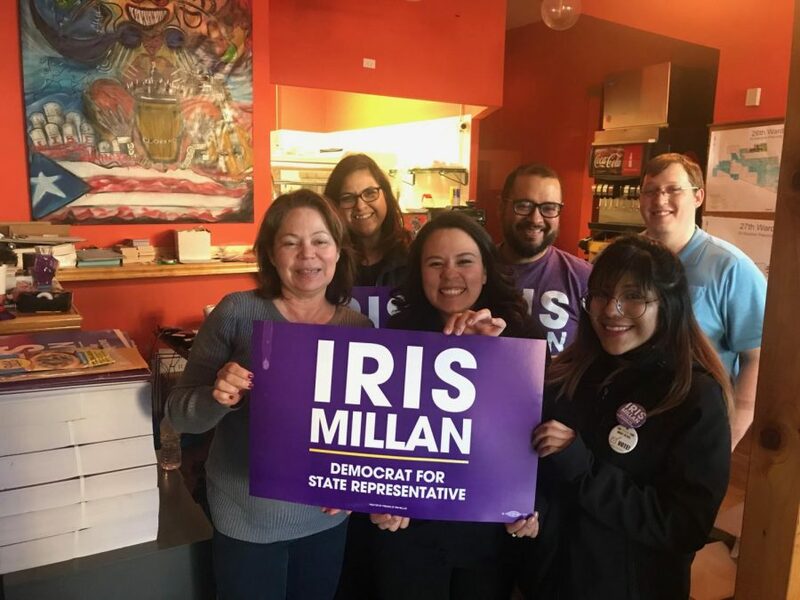 In the initial stages of her campaign, Millan was utilizing the place where her husband’s restaurant used to be in by Western Ave and Le Moyne St and then opened the second office as more interns and volunteers joined her team. “It really did take a village to bring me to where I am today,” Millan said. Business Administration student Melanny Buitron was the treasurer for Millan’s local campaign. It was a volunteer position where Buiton went through training to be prepared for the role. Buitron said she met Millan when she was the Vice President of Latin American Student Organization (LASO) at Wilbur Wright campus of City Colleges of Chicago. Millan was helping them fundraise for a student scholarship LASO designed and to raise awareness of the undocumented student population on campus. Buitron said Iris is her mentor and would try to help her with internship opportunities like Chicago Votes and being an intern for Senator Richard J. Durbin, who Millan also interned for. “It was a life-changing experience for me as an immigrant to be able to work in the office of one of the most (persistent) advocates for immigration rights in our nation,” Millan said about Senator Durbin. Since becoming the treasurer for Millan’s campaign, Buitron said her mixed-status family are more inclined to vote; her younger sister is motivated to vote now because she sees Buitron being politically active. “Being undocumented, I assumed I’d never be involved (in politics) because I can’t vote,” Buitron said. “But then with Iris connecting me with those internships, I got the exposure that changed my perspective. I can’t vote, but I can still encourage those who can to vote and to see the importance of it. “Local politics matters so much more than the presidential one. We live in Chicago, in this area and this is where it matters most, it impacts us every day,” Buitron concluded. “Leaders are not self-made. You dive into an endeavor knowing you are not going to get there alone,” Millan said. “That has been the case with the ENLACE program, at work, with my family and every single experience in my life.